Angela Bassett and Samuel L. Jackson star in the sleeper-hit play out of London titled “The Mountaintop”. This play is set to take place April 3, 1968. It’s the day before the assassination of well-known activist Rev. Dr. Martin Luther King Jr. and the exact location this play happens is in the Lorraine Motel in Memphis, Tennessee. To be even more exact, “The Mountaintop” takes place in room 306, which is the room where Rev. Dr. Martin Luther King Jr. stayed during his last night. As Mr. Jackson makes is way on to the stage, portraying Dr. King himself, he’s apparently playing with different words and phrases in preparation for a speech. Such phrases like “Why America is going to hell” is one that you’ll hear. The play comes across as a source of comfort for many Americans who to this day just can’t seem to make sense of the tragedy that occurred. It lacks, however, any number of breakthrough close-up moments and Mr. Jacksons low-key performance doesn’t really bring Dr. King to life in a new light to breathe new life into the memory of him. In 2010, “The Mountaintop” won the Olivier Award for best new play after playing in London. Being a British production of such a staple in American history, many had doubts about its success on Broadway. The reviews are mixed, but many of them are not too great. Throughout 85 minutes, without a single intermission, Ms. Hall tried to bring the new generations a greater awareness of Dr. King. But the charm it does bring risked being lost in the big city lights and the large-scale aura of what we call Broadway. Some believe it would have been better to keep it on a smaller stage. With settings and projections crafted from the mind of David Gallo, the play opens on a dark, stormy night. Dr. King (Jackson) is retreating to the comfort of his hotel room after delivering the mountainous speech “I’ve Been to the Mountaintop”. Not feeling all that great and wore out, he’s been let down by the turnout for his speech and appearance… he apparently was expecting much more. He’s somewhat paranoid as he checks around the room for listening devices time and time again. He peers out the window and waits for his roommate to arrive. Although you will definitely recognize the setting if you’ve seen “The Man in Room 306”, Mr. Hall brought a new, fresh twist to give it that little something extra. This was through introducing another character: Camae, which is played by Ms. Angela Bassett. She enters the show bringing Dr. King some coffee and is a young hotel maid with a clearly-spirited personality. It doesn’t take long before you can clearly see there’s a certain chemistry between Camae and Dr. King. Some could speculate that this is common with Dr. King and his reputation for being somewhat of a womanizer. Her flirtatious spirit brings a sharp edge to her personality with the foul language she often uses. A young beautiful woman, Camae is far from as innocent as she initially appears to be. Her candor seems to make it easy for Dr. King to somewhat relax and it doesn’t take long at all before he begins putting some of his smooth moves on her. She handles it perfectly without missing a beat and even seems to leave it somewhat open to being successful at some point. This now-Broadway play may surprise many. Although yes, it features Dr. King, it’s far from a serious-laden play about him. The Mountaintop Play seems to try to show something different – that although we know tomorrow will be his last day, we aren’t dwelling on that. Instead, it seems to try to show the intriguing time he may have actually had on his last night there in the hotel room. We do have to make sure to let you know that about two thirds of the way through the play, there’s a surprising twist in the plot. The producers politely request that this twist is not revealed, though. So respecting their wishes, it will not be discussed. You’ll have to go see the Mountaintop Play to find out what actually happens and we politely ask that any readers or those who comment on the site not to reveal what this twist is all about. 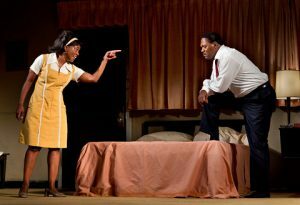 The Mountaintop Play played at the Bernard B. Jacobs Theatre through January of 2012 with an average ticket price of $34.50. Theatre Mania carried a 4.5 star rating for the show.